Glastonbury 2019 will take place at Worthy Farm from 26th-30th June, 2019 (with the main stages open 28th-30th June). Following the closure of the seven-day ticket balance payment window for those who paid a deposit for tickets in October, we’re pleased to announce that a limited number of tickets for which the balance has not been settled will go into our ticket resale, which will be split over two separate days. As in October, we will be giving the first opportunity to book tickets to those who choose to travel to the Festival by coach. The resale for Ticket + Coach packages will take place at 6pm BST on Thursday, 25th April. That will be followed by a resale of General Admission Tickets, at 9am BST on Sunday, 28th April. General Admission Tickets cost £248 + £5 booking fee, with postage by Royal Mail Special Delivery charged at £8.95 per order (coach package e-Ticket delivery is £1.50 per order). There will then be a resale of Worthy View accommodation, Campervan passes and Tipi field accommodation at 11am BST on Sunday, 28th April. The next Glastonbury Festival is in 2019 (we’re having a fallow year in 2018). As part of our ongoing efforts against ticket touting, anyone who would like to attend Glastonbury Festival needs to register in order to buy tickets. You can do that, for free, by clicking here and check your existing registration here. Extensive information about buying tickets for Glastonbury Festival 2019 can be found below. To search this page for specific information please use the menu below, or the search function (ctrl + F / cmd + F) on a computer’s browser. Glastonbury registration is now supported on all major mobile operating systems. Click here to submit your registration. Both UK and International ticket balances of £198 + £5 booking fee per ticket, will be payable in the first week of April 2019 (from 9am Monday 1st April – 23:59 Sunday 7th April), when you will also be able to add car park tickets and cancellation protection to your booking (see CANCELLATIONS & LOST TICKETS for more information). No other site or agency will be allocated tickets. If you miss out on tickets when they go on sale, please bear in mind that any cancellations will be made available for resale at face value via the Festival’s authorised ticket agency, See Tickets. All tickets for the Festival are individually personalised to the named ticket holder and are strictly non-transferable. Security checks are carried out on arrival, and only the specified ticket holder will be admitted to the Festival. To prevent touting, tickets for Glastonbury Festival are non-transferable. Each ticket features the photograph of the registered ticket holder with security checks carried out to ensure that only the person in the photograph is admitted to the Festival. Resale of tickets is strictly prohibited and will result in the cancellation of your order. Online registration is free of charge and only takes a few minutes. We recommend completing your registration by Friday 28th September. Please register well in advance if you intend to book tickets in either the coach or general admission sales in October, to allow time to re-submit your registration if you need to. Registration will close at 12 noon on Monday 1st October, after which there will be no opportunity to submit/re-submit a registration until after both ticket sales. You will need to provide basic contact details and to upload a passport-standard photo. Registration will be temporarily suspended before and during the main ticket sales periods so please allow time for your photo to be approved. Please ensure all your details are correct, and that your photo is in jpeg format, of a suitable size (min 900 pixels wide x 1350 pixels tall), of portrait orientation and passport standard before submitting your details. For more information about how to edit or crop your registration photo, please click here. Once you have submitted your photo, you will receive an automated email confirming receipt of your data, followed by a second email within 48 hours in the working week, either accepting or rejecting your photo, and if successful, confirming your registration number. If you have not received a confirmation email within 48 hours (Monday-Friday) of having made an online application, please check your spam folder. If your registration is rejected or you do not receive a registration number within a further 48 hours please re-register. If you are unable to register online please send an SAE to: Glastonbury Registration, PO Box 4288, Shepton Mallet, BA4 9BB, to receive a postal registration form. Postal registrations will be confirmed within 14 working days of receipt. If you haven’t received a registration number within this period, please contact the Festival Office. Your chance of buying tickets is not influenced in any way by the number of times you register, or the information you provide during registration. Registration does not reserve or guarantee you a ticket. If you have registered since 2010, your registration number should still be valid, however we would advise that you check your existing registration well in advance of tickets going on sale, in case your photo is no longer a good likeness. Look up an existing registration here. Photo technology has improved significantly since the ticket registration system was first introduced. In order to maintain the quality of registration photos on tickets, and to uphold the security of the Festival ticketing system we strongly recommend keeping your registration photo up to date; especially if your photo is more than two years old, or your appearance has significantly changed since you registered, we would recommend updating your registration to a more recent photograph. It is now possible to submit a new photograph and keep your existing registration number. To edit your registration, please enter your registered email address here to receive a link to edit your photo and other registration details. Please note, it is not possible to change your registered photo if you have a current booking linked to your registration details, so please make sure you have an up to date photograph before booking tickets. If you no longer have access to the email account which you originally used to register, you will need to submit a new registration. If in any doubt, please re-register well in advance of when you intend to book tickets. Changes to your name and address will be reflected on your ticket, however if you change these details after you have submitted your order, you will need to also amend your delivery address directly with See Tickets. Any registrations submitted prior to 2010 have been deleted. Anyone with a registration submitted prior to 2010 will therefore need to re-register before they can purchase tickets for the 2019 Festival (unless they already have a valid registration from a later year). If you registered prior to 2010 and intend to buy tickets for the 2019 Festival, please check to see if you have any valid registrations here or submit a fresh registration here. Once registered, you can pay a deposit for up to 6 tickets per transaction when they go on sale at glastonbury.seetickets.com. You will need the registration number and postcode for each person for whom you are booking a ticket. UK Tickets can now be purchased with a UK debit card or Visa or Mastercard credit cards. International Tickets can only be bought by Visa credit card or Mastercard credit card. Please note: See Tickets is the only company permitted to sell tickets for Glastonbury Festival. No other site or agency will be allocated tickets. Balance payments (£198 + £5 booking fee) are payable in the first week of April 2019 (from 09:00 Monday 1st April – 23:59 Sunday 7th April 2019). You can pay the balance for up to 6 tickets in one transaction, providing you have all paid a deposit and they are all the same ticket type. By grouping your balance payments together you will only pay one postage and packing fee. You will need to provide each of their registration numbers and postcodes in order to pay their balances. Please note that you can only pay the balances together if they are for the same type of ticket, so you can pay the balance on up to 6 coach packages together, or up to 6 general admission tickets together, but you can’t pay the balance on a mix of general admission and coach packages in the same transaction. As part of the Festival’s initiative to encourage Festival goers to reduce audience transport emissions, deposits for combined Coach + Festival ticket packages will go on sale at 6pm on Thursday 4th October 2018, giving the opportunity to book coach package tickets ahead of the general release of tickets. 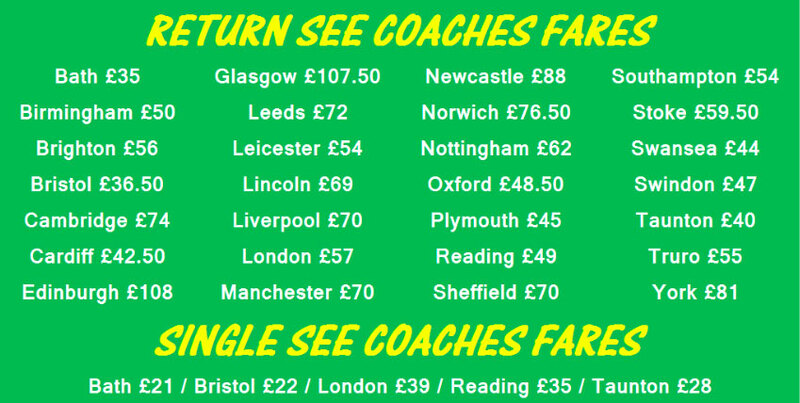 A list of towns and cities covered by the coach packages, and the cost of travel from each departure point, can be found below. To book a combined Coach + Festival ticket package you will need the registration number and registered postcode for each person (up to 6 per transaction) for whom you are booking. You will be asked to choose a Coach Departure Town and Coach Departure Day (Wednesday or Thursday). Please note you must choose one option for your group as a whole – you cannot select multiple options within one transaction. Ticket balances for coach packages will be due in the balance payment window, between 1st and 7th April 2019. Your travel voucher will be sent as an E-Ticket to the email address associated with your registration number. E-Tickets are scheduled to be sent the week commencing Monday 13th May 2019. Your Festival ticket(s) will be distributed once the coach has departed from the pick-up point. Please ensure you all have Photo ID available in order to receive your entry tickets. Coaches are one of the best – and greenest – ways to get to Glastonbury. Our official coach travel partner, National Express, is running services from over 70 locations direct to the Festival’s own on-site coach station right by the Festival gates. Book now at www.nationalexpress.com/glastonbury. The best railway station to reach the Festival is Castle Cary, from where a FREE shuttle bus is available for Festival ticket holders, running between Castle Cary Station and the Festival Bus Station throughout the Festival. The bus station is next to Pedestrian Gate A. The shuttle operates from Wednesday to Monday (there is no service during the night when trains aren’t running). Remember you will need your Festival ticket to use the bus service to the site. For train times, information and tickets visit GWR.com. Please book early to get the best available prices and if using a Railcard do not forget to bring it with you along with your ticket. Car park passes (£45) for Glastonbury Festival 2019 will be available when paying your ticket balance. You will not be able to book car park passes until you pay the balance for at least one of the tickets on your booking. Please note car park passes are only available to general admission ticket holders. It is not possible to purchase a car park pass when booking or paying the balance for a coach package. Car park passes will be sent out with your Festival tickets (unless booked separately). As with your Festival tickets, car park passes are non-transferable, and attempts to re-sell them may result in their cancellation. Refunds for unrequired car park passes are available prior to the ticket refund deadline. Campervan tickets for 2019 will cost £120 for a standard pitch (8m x 7m) or £200 for a double pitch (16m x 7m) and will be released, alongside Worthy View accommodation and Tipis, at 10am on Saturday 27th October. A limited number of additional campervan tickets for the 2019 Festival will go on sale at noon on Saturday 10th November. Please note that demand for campervan tickets is usually very high, so we would recommend booking one as soon as they are released. As with your Festival tickets, campervan tickets are non-transferable and will be printed with the name and address of the booker. Attempts to re-sell them may result in their cancellation. If you book a campervan ticket and later change your mind, refunds are available prior to the ticket refund deadline; subject to an administration charge of £10. Campervan tickets are only available to general admission ticket holders. It is not possible to purchase a car park or campervan ticket when booking or paying the balance for a coach package. Campervan tickets will be sent out with your Festival tickets (unless booked after your balance payment). Only campervans or caravans with fitted sleeping, and washing or cooking facilities will be allowed into the campervan field. Please refer to the CAMPERVAN INFORMATION PAGE for more information about which types of vehicles can use these fields. Whilst every effort will be made to accommodate campervans in your preferred site, the Festival reserves the right to provide alternative facilities in the event of adverse conditions. Booking Refund Protection for campervan tickets is available at £4 per ticket. A limited number of tipis that can each accommodate up to 6 adults will be available for hire in the Festival’s tipi village on the southern slopes of the Festival site. Tipis cost £1075 to hire (payable in full at time of booking). Please note that tipis do not include Festival tickets. Everyone wishing to stay in a tipi must have a Festival ticket. Tipis come complete with groundsheet and rain-catcher; however they are intended to be an elemental experience, without the trappings of ‘luxury’ campsites. You will need to bring your own bedding, and expect to be using basic camping facilities. Tipis and other accommodation options will be available to book at 10am on Saturday 27th October. If you book a tipi and later change your mind, refunds are available prior to the ticket refund deadline; subject to an administration charge of £15. 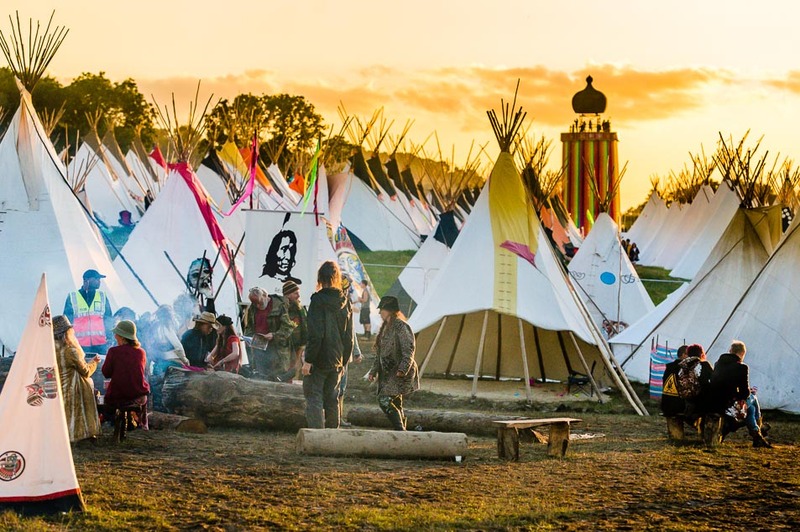 Click here for more details about Tipi life at Glastonbury. Booking Refund Protection is available for tipi bookings, at £22.50 per tipi. Please note there are no separate disabled weekend tickets. Everyone planning to buy Festival tickets needs to register. If you are planning to attend the Festival and are registered disabled, you must register and book your ticket in the usual manner, as described above. Once you have secured your Festival ticket, please contact us for an application form for access to disabled facilities on-site. The closing date to register for the access facilities is Friday 15th March 2019. For further information, please go to the Deaf & Disabled Information page. Everyone aged 13 or over on Wednesday 26th June 2019 (when the Festival starts) who plans to come to the Festival, must be registered in order to book tickets. Children aged 12 and under do not require tickets and do not need to register. You may collect a child wristband for children attending with you from the KidzField or the various Information Points once you have entered the Festival site. Anyone under the age of 16 MUST be accompanied to the Festival by a responsible adult (who must be aged 18 or over and who would usually be the parent, carer or legal guardian). When booking a ticket for a child aged 13, 14 or 15, you must select the ‘CHILD’ ticket option, and confirm that their parent, carer or legal guardian has consented for their data to be processed. When booking tickets for children aged 13, 14 or 15, and/or bringing children aged 12 or under with you to the Festival, you will be required to confirm you are aged 18 or over and accept full responsibility for all under 16s in your group. Those who are aged 16 or 17 are allowed to attend the Festival unaccompanied. This decision should be made with the consent of a parent or legal guardian. It is expected that you will receive your tickets at least 14 days before the Festival starts. Information about the dispatch of your tickets will be available through See Tickets who will email you with your tracking reference. You can track your ticket order via www.royalmail.com by entering your tracking reference number. You can also obtain your tracking reference via See Tickets’ order tracker. To access the order tracker you will require your email address and booking reference number. If you are not at home when your tickets arrive, a card will be left giving you instructions on how to arrange re-delivery (including weekend delivery options) or pick them up from your local collection office. Please note – if you have changed address since booking your tickets you will need to notify See Tickets of your change of address. Changes of address on your registration will not automatically update your delivery address. If you ordered more than one ticket, your tickets will be dispatched to the address you provided for the first name on your booking. If you paid your balances separately, you will each receive your own ticket. UK TICKETS will be sent out by Royal Mail from the week commencing Monday 8th May 2019. Tickets will be sent to the address specified when booking. A signature will be required at the point of the delivery. INTERNATIONAL TICKETS will be sent out by registered international post. You can track your international ticket order via www.royalmail.com by entering your Track and Trace number which is available via See Tickets’ order tracker. To access the order tracker you will require your email address and booking reference number. If it is likely you will set off for the Festival more than 28 days before the event commences, please select the option for ‘Box Office Collection’ when paying your ticket balance. Any ticket deposits for which the balance has not been paid by April 8th 2019 will be automatically refunded to the card on which they were booked; with a £20 administration charge retained and all tickets for which the balance has not been paid will be cancelled. Ultimately it is your responsibility to ensure your ticket balance is paid on time. Tickets for Glastonbury Festival are personalised with a photo of the ticket holder and cannot be transferred to another recipient. If you are unable to come to the Festival, and require a refund for your ticket, please contact See Tickets on 01158 960073 before midnight Friday May 3rd 2019. A £20 administration charge will be retained from all refunded tickets. An additional £10 administration charge will be retained from any cancelled coach packages. (£20 ticket cancellation fee + £10 coach cancellation fee). It is not possible to cancel part of the package – if you are unable to travel on your allotted coach you will need to cancel your ticket booking. You may wish to purchase the optional TicketPlan Refund Protection (£5.70 for general admission tickets, £7.25 for coach packages), so that a refund of the value of your Ticket can be provided to you if you cannot attend the Festival due to the circumstances set out in the Terms and Conditions. Refund Protection is subject to an additional charge per person when paying the balance for your tickets. NB: Refund Protection is only available when making a balance payment or full ticket booking. Click here to download a PDF of the TicketPlan Booking Refund Protection Summary. Refund Protection provides cover for a range of specified unforeseen circumstances that may prevent you being able to attend the Festival. Alternatively, you may wish to check whether your ticket is covered elsewhere. Tickets are non-refundable after the deadline of Friday May 3rd. However, if you have purchased the Refund Protection for your ticket and if your reason for not being able to attend is included, a refund application can be made by online at ticketplangroup.com/glastonbury. The website contains a frequently asked questions section and a “Need Help” button at the bottom of the refund application form should you need to contact the team directly. Please note that Refund Protection will not cover the loss of your ticket, or any circumstances which could be considered foreseeable. Unfortunately, if tickets are delivered to ticket holders, and subsequently lost, destroyed or misplaced, we cannot replace them. Information about Local and Sunday tickets was released after the main ticket sales. Those tickets have now sold out. Click here for info. The local ticket sale is an extra opportunity for local residents to secure general admission tickets, however we’d always advise trying the main ticket sales first, to maximise your chances of getting tickets. Glastonbury Festival Sunday tickets for Sunday 30th June 2019 are available exclusively to Central Somerset residents, as they are the people most likely to be inconvenienced during the preparations for the Festival. Anyone wishing to book a local or Sunday ticket will need to register, if they have not done so already. Please see HOW TO REGISTER above for further information. A limited number of hospitality tickets will be available for the media and those working in the music industry to purchase directly from the Festival. Applications to purchase hospitality tickets will open in late February. As with standard admission tickets, hospitality tickets are subject to the Festival’s Photography Policy and Broadcaster Internet and Filming Policy. For more information please contact the hospitality team. Whilst a handful of the Festival’s neighbours do offer hospitality tickets strictly as part of the accommodation available on their property, these tickets are not permitted to be booked through third parties or agencies, or on a ticket only basis. Over the years there have been problems with off-site providers not supplying the services advertised, therefore packages offered by off-site providers are bought at the purchasers’ risk, and against the advice of Glastonbury Festival, which accepts no responsibility for the services these external suppliers offer. For the avoidance of doubt Glastonbury Festival does not supply tickets to any “concierge services”. 1. Tickets are non-refundable after 3rd May 2019 and always non-transferable. From October 2018 you may reserve a ticket for Glastonbury Festival (hereafter “the Festival”) with a deposit of £50. The full balance is due by April 7th 2019. If the balance is not paid by the applicable deadline then the amount you have paid less a £20 administration fee will be repaid to you. If you pay for your ticket in full by the applicable deadline but cancel by 23:59 on 3rd May 2019 you will be reimbursed the value of your ticket less the £20 administration fee. After 23:59 3rd May 2019, no refunds will be made other than in the event of the cancellation of the Festival. Booking fees and postage and packing charges are non-refundable. 2. The artist and performer line-up and all billed attractions are subject to change at any time without notice. (d) in order to facilitate the security, safety and comfort of all guests the Premises Licence Holder may refuse entry to ticket holders who attempt to enter the licenced Festival site, or any surrounding land used by the Festival (including car parks) that constitutes the Festival footprint, (hereafter the “Festival Site”) with contraband goods and / or prohibited articles. Please refer to www.glastonburyfestivals.co.uk for information on items which will not be allowed onsite. 4. Admission is at ticket holder’s own risk. Glastonbury Festival Events Ltd and the Premises Licence Holder will not be held liable for any loss, injuries or damages sustained at the event including damage, theft or losses to property and motor vehicles, if the cause is due to the negligence of the ticket holder or the actions of other patrons or third parties or force majeure. 5. Duplicate tickets will not be issued for lost or stolen tickets. 6. Tickets are only valid when purchased from official agents. Tickets bought from other sources will be refused admission. (c) purchased by an agent on behalf of his or her principal. (b) the ticket may be confiscated and there shall be no obligation on Glastonbury Festival Events Ltd to refund any monies paid for the ticket. 9. Commercial, promotional and trading activities are not permitted on the Festival Site or without express prior written permission of Glastonbury Festival Events Ltd. Please note Glastonbury Festival Events Ltd will charge a fee for any commercial activity (including filming, photography and recording) on the Festival Site. a) a person may be denied entry to, or removed from the Festival Site if he or she is found in possession of any equipment capable of taking photographs, making films, sound recordings or broadcasts; or if he or she takes any photograph, makes a film, sound recording or broadcast of anything occurring inside the Glastonbury Festival for commercial gain. b) a person may enter the Festival Site with equipment referred to in 10. (a) above where it is integrated into electronic communications apparatus designed for personal private use (such as a mobile telephone) and/or a personal stills camera, but the person may still be removed in accordance with paragraph 10. (a) above if they attempt to use this device for commercial gain. 11. Tickets cannot be used as part of any marketing, media, sales promotion, staff reward programme or general competition use whether commercial or non-commercial without prior written permission of the Festival organisers. The marks Glastonbury and Glastonbury Festival and the Glastonbury Festival logo are registered United Kingdom and European community trademarks and may not be used without the express written permission of Glastonbury Festival Events Ltd.
12. As a condition of sale the ticket holder consents to being filmed, photographed and recorded for television, radio, webcast and other public broadcast in any medium and/or for any video or DVD as part of the audience and/or by any CCTV cameras and recordings operated by or on behalf of and made by or on behalf of Glastonbury Festival Events Limited for public safety and security purposes. 13. Wristbands removed from the wrist or tampered with will be rendered invalid and will not be replaced. Lost or missing wristbands will not be replaced. Those without wristbands will be refused admission to the site or may be removed from the Festival Site. For security purposes this ticket remains the property of Glastonbury Festival Events Ltd at all times and all wristbands issued by Glastonbury Festival Events Ltd remain the property of Glastonbury Festival Events Ltd until 5pm Monday 1st July 2019. 14. Anyone under the age of 16 must be accompanied to the Festival by a responsible adult (aged 18 or over, who would usually be the parent, carer , legal guardian or other adult entrusted with the care of that child) who accepts full responsibility for all under 16s attending under their supervision. 2. Cars, caravans and campervans require a separate ticket. Please see www.glastonburyfestivals.co.uk for more information. 3. Do not buy tickets from street traders or unauthorised agencies. Tickets are security printed and are personal to the ticket holder only. Any attempt to transfer or resell tickets will lead to automatic refusal at the entrance. Beware of forgeries. 4. Glastonbury Festival Events Ltd accepts no responsibility for goods or services purchased from third party traders. 5. Official merchandise will be available onsite. Please don’t buy from unlawful street traders. 6. Please only use the toilets and urinals provided. Do not pollute the streams and hedges. 7. Please use the litterbins and recycling points provided. 8. Your vehicle may be searched by security personnel at the vehicle gates on entry to the Festival car parks; in the car parks themselves; or anywhere on the Festival Site. 9. You may be searched in the car parks or at the entrance. Any items which the organisers consider may be used in an illegal or offensive manner shall be confiscated. Persons suspected of carrying out illegal and/or offensive activities onsite may be searched. Anyone resisting confiscation of disallowed items or disregarding these conditions will face eviction from the Festival Site. 10. No animals are allowed onsite, with the exception of registered guide dogs. 11. Fireworks, Chinese/flying lanterns, drones, flares and the burning of plastics are not permitted. Please see the Festival website for details of other prohibited items. 12. To protect your own safety and those of other guests, please act responsibly. 13. Medical treatment at the Festival is provided by Festival Medical Services who are a separate legal entity. Any claims resulting from medical treatment onsite should be directed to Festival Medical Services. Glastonbury Festival Events Ltd accepts no liability for any injury, claim or damages resulting from any medical treatment onsite. 14. Disabled facilities are available – please refer to the Festival website for further information. 16. Glastonbury Festival operates a ‘Challenge 21’ policy for alcohol sales. If you look under 21, you will not be served alcohol unless you can prove you are over 18 – by presenting ID, or by wearing a ‘Challenge 21’ wristband. Full details can be found on the Festival website. 17. Please note that some areas may have age restrictions for entry. Those wishing to attend should bring suitable ID as proof of age, and parents and responsible adults should ensure that all restrictions are adhered to. For films classified as 18, a ‘Challenge 21’ policy will apply. 18. Glastonbury Festival Events Ltd does not offer refunds in the event of lost or stolen tickets or where the ticket holder cannot attend the Festival due to reasons beyond the Festival’s control. You might consider it prudent to insure the value of your ticket in the event of such loss. – You must not book a coach package unless you are certain you will be able to travel on the coach you have selected. – Travel on your chosen coach is mandatory in order to receive your Festival tickets. – Under no circumstances can a coach package ticket be exchanged for a standard admission ticket, or other ticket types. – Only your coach travel tickets will be dispatched in advance – your Festival entry tickets will be handed out mid journey on the coach. – You will be required to show Photo ID to receive your Festival tickets. – You can only book coach packages from one destination and in one time period, per transaction. – All passengers including children aged 12 and under, and Personal Assistants allocated tickets under the Disabled PA scheme, must purchase a valid coach ticket in order to travel. – If you are travelling with children aged 12 or under, who do not require an entry ticket for the festival, or a PA allocated tickets by the Disabled Access Coordinator you will need to book the required number of additional seats whilst making their Coach Package booking. – If the additional seats required are not available when booking, please contact coachtravel@seetickets.com upon completing your booking in order to purchase your additional coach seats (NB: standard fares apply). – See Tickets cannot guarantee all coaches will have wheelchair access and storage facilities. If you require wheelchair access or wheelchair storage you must contact [coachtravel@seetickets.com] no later than 30 days prior to departure to ensure the appropriate facilities can be provided. – Where departure times are not stated, you must be available to travel at any point (AM/PM) during the specific day you have selected. – All departure times / points will be released to you no later than 30 days prior to the event. – In order to facilitate a speedy departure from the Festival site, See Coaches reserve the right to board passengers outside of scheduled departure times, should seats be available on alternative services. – It is not possible to cancel part of the package – if you are unable to travel on your allotted coach you will need to cancel your ticket booking. – An additional £10 administration charge will be retained from any cancelled coach packages. (£20 ticket cancellation fee + £10 coach cancellation fee). If you pay a deposit for more than one ticket you will have the option either to pay the balance collectively or individually. Balance payments can be made from additional cards at a later date, however each ticket for which the balance is settled separately will be processed as a single booking and will therefore be subject to postage fees per individual transaction. It is your responsibility to remember to pay your balance. Any tickets for which the balance has not been paid by 23:59 on Sunday April 7th 2019 will be refunded £30. A £20 administration fee will be retained. Tickets purchased in resales after April 8th 2019 must be paid for in full at point of booking. Payment by card for UK sales is by the following card types – Visa Debit, Visa Credit, Visa Electron, Switch/Maestro Domestic, Solo, Mastercard. For the purpose of ticket sales the UK includes Northern Ireland, the Isle of Man and the Channel Islands. Sales will be processed immediately in most cases and certainly within five working days of the sale being confirmed. As part of our continued commitment to ensuring that all tickets for Glastonbury Festival are purchased securely by genuine Festival goers you may be asked for additional security information when purchasing Festival tickets online from seetickets.com. Depending on your method of payment, you will be directed to either Verified by Visa or Mastercard SecureCode for payment authorisation. If you often make purchases online you’re probably already signed up, but if you’ve not already subscribed to one of these services you will need to do so before your transaction can be processed. For the avoidance of doubt please check your bank/card statement following your transaction/s to be certain whether or not your payment has been successful, or contact See Tickets. When purchasing online, you will be sent a confirmation email and booking reference number. Please check your spam folder if you do not receive this within 24 hours. Keep the confirmation email safe. If you have any queries about your purchase you will need the booking reference number. You will be able to use the ticket tracker with the booking reference number to confirm your purchase. Any transaction that results in a charge back or payment dispute will be cancelled. It is your responsibility to ensure that you have sufficient funds in your account to pay for the tickets. The transaction will be completed during the five working days following the sale. Glastonbury Festival will cancel all bookings made using multi-hit software or applications to ensure everyone has a fair and equal chance of getting a ticket. Attempting to book tickets on multiple browser tabs can cause your transaction to fail. We advise that you use one single browser tab only when booking tickets, in order to avoid problems with your transaction. As part of Glastonbury Festival’s commitment to eradicate the touting of tickets, the Festival permits the purchase of a maximum of one ticket per person. Any duplicate orders will be cancelled. In the instance of a duplicate order being cancelled, the purchaser will be refunded less the applicable administration fee. All international ticket buyers must be registered in the same way as UK bookers. International ticket purchases can only be made using either Visa or Mastercard credit cards. If you are not a UK Citizen but are currently in the UK, and have a UK registered credit or debit card and UK address, you can buy in the same way as a UK resident. International tickets will be sent out by registered international post unless stated otherwise. Please ensure you give your full international address when booking. If you will be travelling in advance of the Festival or leaving for the UK more than 30 days before gates opening, please select the option for Onsite Box Office Collection. If you are unable to receive your tickets by international post, please contact See Tickets immediately upon receiving your balance payment confirmation email. An overseas resident can ask a friend who is resident in the UK to purchase on their behalf, using that friend’s UK address, or alternatively, a UK resident can purchase a ticket for an overseas resident as one of their ticket purchases – provided that overseas resident is registered. International ticket balance payments will be taken at the same time as UK balance payments: from 09:00 Monday 1st April until 23:59 Sunday 7th April 2019. As with UK transactions, it is your responsibility to remember to pay your balance. Any tickets for which the balance has not been paid by 23:59 Sunday 7th April 2019 will be refunded £30. A £20 administration fee will be retained. If you booked a Coach Package, then an additional £10 will be retained should you cancel your booking. Glastonbury Festival does not reserve group bookings. If you are planning to celebrate your wedding/handfasting/hen party/significant birthday/end of exams bash at the Festival, everyone in your group needs to register and purchase tickets in the same way as anybody else buying tickets. Once you have booked a ticket, you can access information regarding your ticket booking, including details of ticket dispatch, online at [https://www.seetickets.com/customerservice] using your booking reference number and email address or postcode; or by calling 01158 960073. Calls to the See Tickets customer service centre are charged at standard geographic local rates plus your provider’s connection charge, depending on your service provider, this may be free to call if covered by inclusive minutes on landline and mobile tariffs. Calls from mobile phones will be significantly higher. Please get the bill payer’s permission before you call. All tickets will be personalised with the passport photograph submitted by the ticket holder during registration. As long as your registration photo is a good likeness, you do not need ID to enter the Festival. Every ticket holder will be required to present their personalised ticket. Checks will be made at the gates. If you are not the person whose face is printed on the ticket you will be denied entry. Children aged 12 and under, and child ticket holders, must be accompanied by an adult ticket holder. If you are bringing a child aged 12 or under with you who looks older than 12 it is advisable to bring ID to verify their age. Anyone under the age of 16 must be accompanied to the Festival by a responsible adult (aged 18 or over and who would usually be the parent or legal guardian). When booking a ticket for a child aged 13, 14 or 15, you must select the ‘CHILD’ ticket option, and confirm that their parent or legal guardian has consented for their data to be processed. Those who are aged 16 or 17 are allowed to attend the Festival unaccompanied, but we would strongly advise that this decision is made with the consent of a parent or legal guardian. Glastonbury Festival operates a ‘Challenge 21’ policy for alcohol sales. If you look under 21, you will not be served alcohol unless you can prove you are over 18 – by presenting ID, or by wearing a ‘Challenge 21’ wristband. Full details here. Glastonbury Festivals Ltd (registered company number 02737866, together with its event organisers, Glastonbury Festival Events Limited, registered company number 04348175) and “See Tickets” (The Way Ahead Group Limited, registered company number 03554468) are committed to protecting your personal information. The personal information provided as part of each registration will be stored and processed by See Tickets (the data processor) solely on behalf of Glastonbury Festivals Ltd (the data controller) for the purpose of notifying you when tickets for the Festival go on sale, processing any booking you may make for Glastonbury Festival and printing any tickets you purchase with your personal details and photograph, to ensure that any ticket you purchase can only be used by you. No information collected through registration will be offered for sale or made available to any third party. Your details will be retained for future ticket sales, so you do not need to submit a new registration each year, however we would advise that you check your registration details annually, and prior to making a booking, to ensure that all your details are up to date, and your photograph is still a good likeness. In order to do so, please make sure the email address you provide is one to which you have long term access. To delete your registration, please visit glastonbury.seetickets.com/registration/Edit. Please note this is a separate database to the Festival Newsletter. To unsubscribe from the Glastonbury newsletter mailing list, simply click the link at the bottom of any newsletter email or follow the link to subscribe or unsubscribe here.